Nature's Miracle 3 in 1 Odor Destroyer instantly breaks down and eliminates odor. The advanced triple-action formula destroys airborne, fabric and hard surface area odors. Spray in the air or on surfaces such as litter boxes, pet beds, cages, sofas, carpets, cars or anywhere your pet goes. 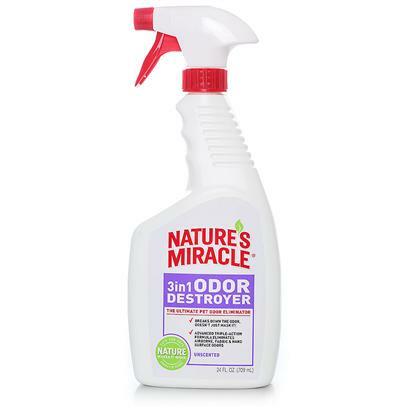 Nature's Miracle 3 in 1 Odor Destroyer is safe for use around children and pets. Keep out of reach of children. Can cause eye or skin irritation. If contact occurs, rinse thoroughly with water for 15 minutes. If attention occurs, seek medical attention. Harmful if swallowed. Do not spray directly on your pet. Follow directions on spray bottle.